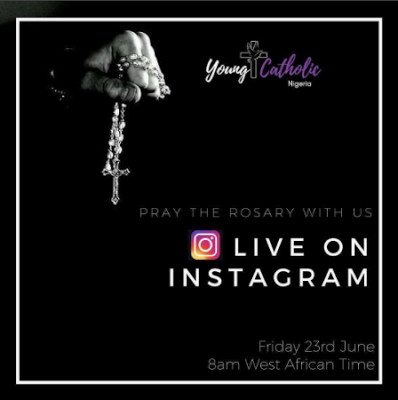 Just as the Hallelujah challenge comes to an end, Young & Catholic Nigeria has announced that there will be a rosary challenge live on Instagram for Catholics all over Nigeria who are willing to join. It was not exactly termed a rosary challenge but it requires that participants come live on Instagram at a certain time of the day to join others in doing a live recital.. The rosary challenge began on June 23rd and is expected to continue till October. According to Ebuka, who shared the information on his Instagram account, the rosary will be recited in the mornings. Youngandcatholicng announced on it's Instagram page that the Instagram live rosary is to mark the Marian Year 2017. "Good Morning Instafam! 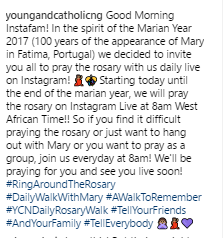 In the spirit of the Marian Year 2017 (100 years of the appearance of Mary in Fatima, Portugal) we decided to invite you all to pray the rosary with us daily live on Instagram! Starting today until the end of the Marian year, we will pray the rosary on Instagram Live at 8am West African Time!! So if you find it difficult praying the rosary or just want to hang out with Mary or you want to pray as a group, join us everyday at 8am! We'll be praying for you and see you live soon! #RingAroundTheRosary#DailyWalkWithMary #AWalkToRemember#YCNDailyRosaryWalk #TellYourFriends#AndYourFamily #TellEverybody"